A bullet train can travel up to 267 MPH! San Fran to LA is 383 miles, 86 minutes in a bullet train vs 90 minutes by air. Trains are far more energy efficient than airplanes or even electric cars because cars run on rubber tires while trains use steel wheels on steel rails or magnetic levitation which is the most energy efficient type of travel. These are the two biggest places in California so there’s a lot of people who would ride a bullet train. Same for Manhattan to DC. Millions upon millions of riders. Best way for Trump to get from DC back home to NYC ot to Mar-a-Lago in Florida. Miami to DC is 1053 miles, five hours 15 minutes by bullet train or using Elon Musk’s individual Tesla Electric cars at 150 miles an hour that could charge on the move would cut the 20 hour NYC to Miami drive to about seven hours driving your own car in a tunnel. Tunnels are less expensive to build than normal ultra high speed roads that would have to have tunnels built above ground or on elevated tracks. Travelers would need Uber cars once at their destination or simply buy another rust-bucket and garage it at the other end. Or rent a nice ride and enjoy the entire experience. China wins again, also serving as home to the world’s fastest non-maglev train currently in service. The name “Fuxing Hao” translates to mean “rejuvenation,” and each of the two trains have been branded with nicknames: CR400AF is “Dolphin Blue,” and the CR400BF is “Golden Phoenix.” The “CR” stands for China Railway. Both take just under five hours to zip up to 556 passengers each between Beijing South and Shanghai Hongqiao Station, easily halving the nearly 10-hour time it takes to ride the conventional, parallel rail line between these two megalopolises. The “Rejuvenation” also beats China’s next fastest train, the “Harmony” CRH380A; it has dazzled since 2010, with speeds of up to 236 mph on routes connecting Shanghai with Nanjing and Hangzhou, and Wuhan with Guangzhou. Japan is celebrating the 54th anniversary of high-speed train travel this year, since it was way back in 1964 that the Hikari high-speed train launched service between Tokyo and Osaka, cutting travel time between the country’s two largest cities from nearly seven hours to a mere four by rail. The H5 and E5 series Shinkansen, respectively running the Tohoku and Hokkaido services, are two of the newer bullet trains on Japan’s tracks, and so far the fastest in regular commercial service in the country. 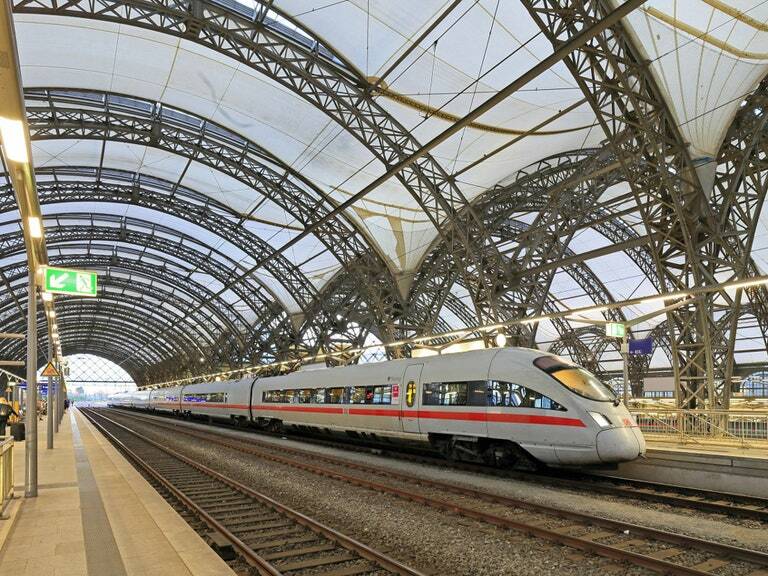 The distinctively futuristic white and silver of the Inter-City Express, or ICE, combined with its sharp red cheatline, makes an impressive sight speeding through scenic German countryside, especially on its newest route connecting Berlin and Munich. Similar to Spain’s Renfe AVE train, Germany’s fastest train is another Siemens design, the Velaro, and was built to fit through the Channel Tunnel. That’s a serious asset for DeutscheBahn’s long-term plans to operate these trains from Frankfurt to London. Ocasio-Cortez’s Green New Deal Lacks Greenbacks Spike Lee Still Doesn’t Get It… The Problem? … His Problem and the Problem with a Lot Of Liberals Is That What Really, Really Counts About Black People Starts In Africa…. What’s He Done About That?